We are very happy to announce that this great event is returning to the famed State Street Steps of the Capitol, and again Bishop Robert C. Morlino will help kick it off. Please join us June 20th at 7pm for 15 decades of the rosary, on the vigil of the 2013 Fortnight for Freedom called by the US Bishops. You can click the poster image above to view a huge JPG version, or download a print-friendly PDF. The HHS Mandate is a new rule announced by the U.S. Dept. of Health and Human Services that requires nearly all employers to provide health plans that include free contraceptives, sterilizations and abortion inducing drugs. Never before has the U.S. government forced educational, health care or other religious institutions to provide their employees something which directly conflicts with their religious teachings. Please Come And Pray With Us! Yes, just as last year, a Rosary Rally will be held weekly, every Thursday until late fall! Please join us every Thursday beginning June 20 for the 2013 Capitol Rosary Rallies. 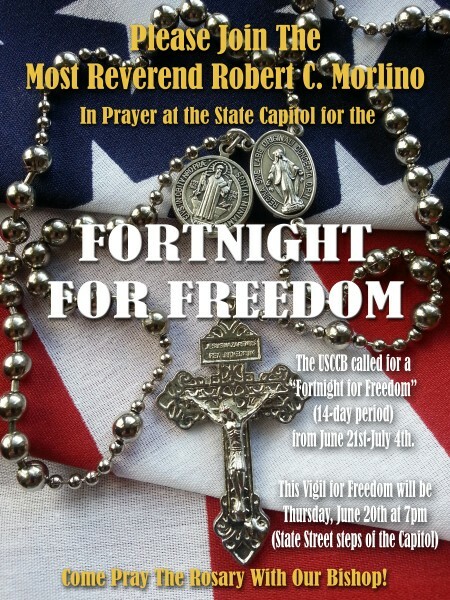 Bishop Robert Morlino will lead the 15 Mysteries of the Most Holy Rosary at the first rally on June 20 for the Vigil of the USCCB 2013 Fortnight For Freedom. 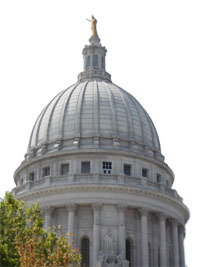 Bishop’s Rosary begins at 7 p.m. on the State Street steps of the Capitol in Madison. The June 27 and July 4 Rosary Rallies also fall within the Fortnight. The Rosary Rallies continue every Thursday at 7 p.m. up through October 31. Please come to the State Street steps of the Capitol and join us in prayer for Life, Marriage, and Religious Liberty during this critical time in our nation’s history. God bless you and God bless America! Thank you Elizabeth! Excellent job! We petition Our Lady to provide beautiful weather that night! See you there!